I set my broom aside, smoothed my shirt, and calmly turned to face him. Bright-eyed and curly-haired, he stood – completely oblivious to the fact that he had said the words no woman ever wants to hear. And then I let him have it. I bent down, coming only inches away from his little round face, and said, “Why…thank you!” Then I smiled big, stood to grab my broom, and returned unscathed to the task at hand. But now, to the glory of God, moments like that are reminders to me that the miraculous has happened: I no longer hate my body (especially my back side); in fact, it has become one of the biggest blessings in my life. Like most women (really every woman I’ve ever met), I lived years literally disgusted with what I saw in the mirror. The territory between my ears felt like nothing short of a war zone, with battles being fought everywhere: the bathroom, the grocery store, the bedroom, even church. I could never silence the ambush-ready community of inner critics (those hurtful thoughts we all think) that called my head home. And I missed out on so much: parties I refused to attend because my pants were too tight, dates with my husband because of a few gained pounds, quality time with my kids. I know I’m not alone in this. We women have been lied to for years. We’ve been told that our value – our very right to be seen and celebrated - is determined by our waist-to-hip ratio or the proportions of our facial features, and that’s just not true. Our value is determined by the only One who really knows it: our God. After hitting my head hard on the floor of my personal pit of despair, I slowly began my journey toward believing that. One inch at a time of healing, truth, and righteous anger led me to a life-saving realization: All those years I was desperate to change how I looked, God was desperate to change how I see. And He did. Truth is, if God can make a prostitute the great grandmother of the Messiah, turn water into wine, and make blind men see; don’t you think He can turn a big bottom – or a big nose - or bird-thin legs – or whatever it is you hate – into a blessing. He did it for me, and I’m so ridiculously happy about the journey that I wrote a book about it. Check back for my review soon! 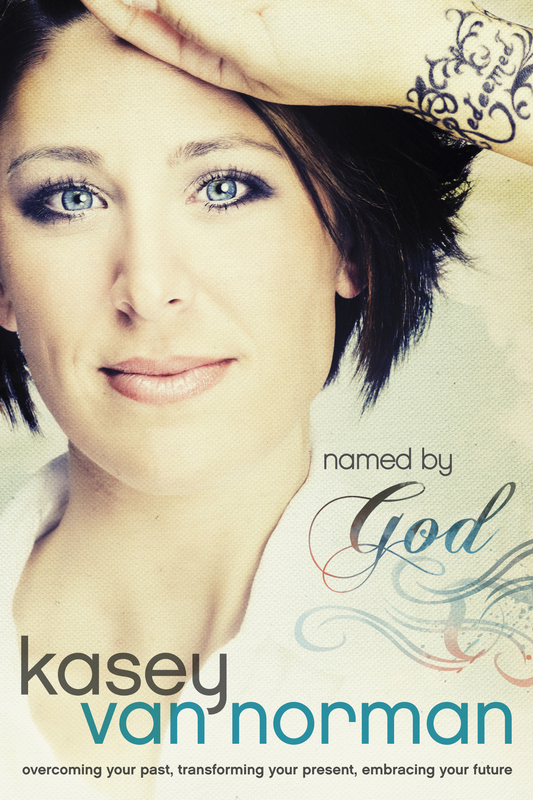 In Named by God, Kasey Van Norman shared the message what was on her heart for helping people realized the importance of reaching out to the hurting people. Kasey has experienced her own share of heartache and pain. During her early teenage years, her parents went through a bitter filled divorce. Kasey started putting on a fake mask to cover up her hidden emotions and disappointments. She felt the need to pretend and act as if everything was going fine in her life in order to achieve acceptance. When Kasey was a freshman she was raped by her boyfriend at the time. Kasey knows firsthand the difficult of healing from your past where you can conquer your future. She has struggled with finding acceptance and love, with an eating disorder, cutting herself, and engaging in hiding her throbbing emotional pain. But God has always been there assisting her to come out, face the truth, deal with her past, and not letting it destroy her future. “Perhaps one of the greatest human misconceptions is that it’s possible to forgive another person prior to extending love to him or her. The hard truth is that if you desire authentic healing and a God-honoring lifestyle, you must choose to forgive in the same way our Lord does-by extending love first” (Page 77). One story that Kasey shared helped me to see the wounds that I have repeatedly held firmly to. Kasey described the event of cooking and accidently cutting your finger with a knife. You grab a towel and able pressure to the wound to stop the bleeding. Then you wrap it up with a Band-Aid hoping that will fix the cut wound. Many times we refuse to seek help from others when sometimes we desperately need to. The scenario is an analogy to how we hold onto un-forgiveness in our hearts. This chapter showed me how I was holding onto past hurts in my life and living by how I feel. I can’t forgive someone by declining my love to someone who hurt me. Forgiving an enemy requires truly loving our enemies and friends like Christ would. I would recommend this book to everyone who is struggling with wrong thinking and believes the lies from Satan. If you need an encouragement book then read this book! This book contains tons of scripture references that fellow believers need to hear and believe! This book has the potential and impact to reveal the truth of living your life’s with purpose. Kasey has deeply publicized her struggles she has experienced and how she overcame them. God has turned her inner pain into something good. This book has astonishing teachings that if applied can dramatically change your life. Being named by God is a marvelous truth that we must let comfort our very souls! Tyndale House Publishers has provided me with a complimentary copy of this book. "You probably want to hear about Jennifer and the demons and how I played chicken with a freight train and-oh yeah-the weird murder . . . you're definitely going to want to hear about that." Sam Hopkins is a good kid who has fallen in with a bad crowd. Hanging around with car thieves and thugs, Sam knows it's only a matter of time before he makes one bad decision too many and gets into real trouble. But one day, Sam sees them harassing an eccentric schoolmate of his named Jennifer. When Sam finds the courage to face the bullies down, he loses a bad set of friends and acquires a very strange new one. Because Jennifer is not just eccentric. To Sam, she seems downright crazy. She has terrifying hallucinations involving demons and the devil and death. And here's the really crazy part: Sam is beginning to suspect that these visions may actually be prophecies--prophecies of something terrible that's going to happen very soon. Unless he can stop it. With no one to believe him, with no one to help him, Sam is now all alone in a race against time. Finding the truth before disaster strikes is going to be both crazy and very, very dangerous. Crazy Dangerous is a youth adult mystery novel featuring demons and thugs. The book is about good vs. evil and it has a Christian theme. I connected with the main character Sam Hopkins because he is the preacher’s child who is torn between living up to everyone expectations of how perfect he thinks he has to be. As a society, we tend to forget they are human just like anyone else. The book had a great lesson and storyline that I think teenagers and adults can relate to. Bullies and thugs are present and they try to lead Sam down the wrong path into becoming just like them. Sam wants desperately to fit in with the tougher kid’s crowd and to be accepted, and little by little, he tells himself that he is in control of the situations. Most people tend to keep telling themselves they can stop and say no to peer pressure at any time. But the truth of the matter is we keep reasoning with ourselves and lying to ourselves and so normally we keep doing it. People at school change and start defining Sam by the people he starts to associate with. In life, we have to choose our friendships wisely or we run the risk of heading down a path that could possibly lead to trouble. This book shows the impact of making bad and good decisions and the consequences that we have to face. The book contains a brilliant message about judging others too quickly as if we know everything. Jennifer had visions and hallucinations about demons planning on doing something to harm and manslaughter many people’s lives. But only one person believed her and that was Sam. Everyone judged her into being schizophrenic and claimed that she didn’t know what she was talking about. A slogan for the book is “Do Right, Fear Nothing”. I realized the importance of choosing and making the right choices, especially when I don’t feel like it. I also have to face my fears and not fear the unknown. I immensely enjoyed reading Andrew Klavan’s new book because it had an awesome exciting adventure plot that unfolds many lessons we must learn. This book is not only for teenagers, adults would benefit from reading it too. If you enjoy mystery and action overflowing novels then this book is for written for you! This book brought many lessons to life in my own life that I have to learn. I learnt to watch who I judge, don’t associate with people who are doing to bring you down, always do the right thing, and don’t let fear control you and stop you from living! “I received this book for free from Litfuse Publicity Group/ Thomas Nelson for this review”. Andrew Klavan was hailed by Stephen King as "the most original novelist of crime and suspense since Cornell Woolrich." He is the recipient of two Edgar Awards and the author of such bestsellers as True Crime and Don't Say a Word. His books and screenplays have been turned into films directed by Clint Eastwood and starring Michael Douglas, Ed Burns, Michael Caine among others. Books Sold to Date: Over 1.5 million. Celebrate with Andrew Klavan by entering his Crazy Dangerous giveaway and connecting with him during the Author Chat Party on 5/29! A copy of Crazy Dangerous by Andrew Klavan for YOU and 5 of your Friends! Enter today by clicking one of the icons below. But hurry, the giveaway ends at noon on May 28th. Winner will be announced at the "Crazy Dangerous" Author Chat Facebook Party on 5/29. Andrew will be hosting an Author Chat, testing your survival trivia skills, giving away books and gift certificates to iTunes and Amazon.com! Don't miss a second of the "danger"! Grab your copy of Crazy Dangerous and connect with Andrew on the evening of 5/29/12 for an author chat and lots of giveaways. Don't miss a moment of the fun. RSVP today and tell your friends via FACEBOOK or TWITTER and increase your chances of winning. Hope to see you on the 24th! In Psalm 91 Military Edition, Peggy Joyce Ruth has written this book to convey the safety and the power of reading and speaking out the word of God. It is imperative that we believe what the truth God reveals to us through his written word. Peggy takes readers through the Psalm of 91 verse by verse. Many military lives have been saved by soldiers mediating and speaking this Psalm out loud while in the face of extreme danger. Many lives could have been lost if they didn’t have people back home praying Psalm 91 over them. The power of prayer is shown through the countless stories of protection from evil forces. This book is written for primarily for military official and families of people who are in the military. I would recommend this book to everyone that is graceful to be free. The book will be a huge benefit for people who are serving our country. People who aren’t in the military will be able to apply the verses of protection into their own lives. Our military risk their lives where we can accomplish our dreams and live in freedom. We at least need to pray protection over their lives and their families. This book has wonderful potential to make a different in our daily lives if we take the message of Psalm 91 to our hearts. The book is a little book where it is easy to carry along to combat on the battlefield and off. You don’t have to be in a war to pray Psalm 91 over your lives. This book would make a great gift to anyone who is in the military! This book contains encouraging stories that will lift your spirits if you doubt that pray doesn’t make a big difference. Believe me prayer brings you comfort and hope over any situation! Charisma House has provided me with a complimentary copy of this book. In God Loves Broken People, Sheila Walsh enforced the concept of dealing with your feelings of being broken. There are many ways to handle your wounds from your past. Shelia encouraged readers to believe and study what the Bible declares over your difficult circumstances. She described her own feelings about hurts in life and not understanding why bad things happen. She wrote this book to reveal her own struggles with her broken pieces. Jesus is always there to assist us when we are going through our hurts and our pains. One of my favorite examples that Sheila shared in her book was how her husband had an extreme fear of water. The fear was passed down from his very own father. His father got robbed in a grocery store and they beat him and nailed him to a whiskey barrel. The fear of living his life and the pain he endured consumed his father. One day his father was watching the news broadcast. There was a breaking headline of the day telling about a boat drowning accident. He warned his son to never get in the water on a boat because he would drown. Sheila’s husband as an adult made a choice to start reading and speaking the word of God to overcome his fears. He decided that he didn’t want to pass down this generational fear of the unknown to his son. Now father and son go fishing together on the boat trusting that God will protect them. This story spoke volumes for me! The lesson is to believe the truth of God’s prevailing and life altering word. Fear and spoken negative words over our lives can be transformed with God’s healing and changing power. I would recommend this book to anyone who is struggling and feeling like they are the only one going through difficult times in their life. If you’re feeling broken and beat down by life then this book will offer you hope that God is still on the throne controlling all things. Asking the why things happen in our lives seem to be a common thing we have all done. It’s comforting to know that we aren’t alone in our struggles and heartbreaks. Our Savior is ready and willing to lead us broken and all until we make it to the other side. Even when we do make it home he will still be there but only then will we be completely whole. This book will reveal the truth to you about how much God still desperately loves you especially through your broken pieces! 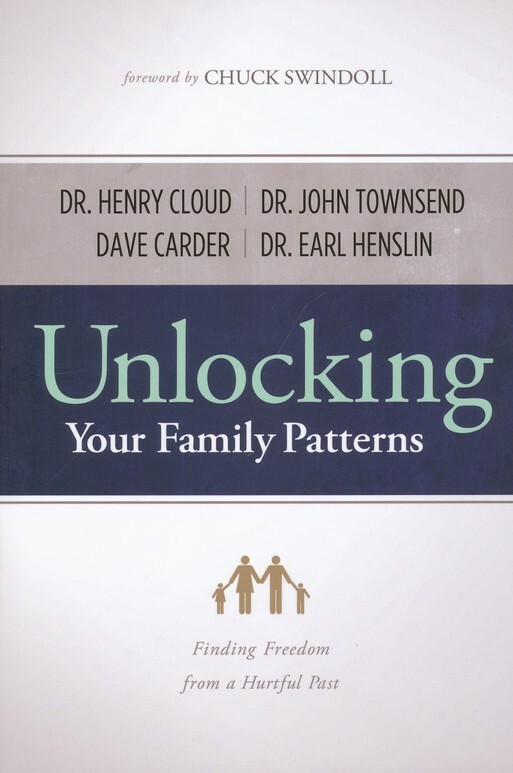 In Unlocking Your Family Patterns, Dr. Henry Cloud, Dave Carder, Dr. Earl Henslin, and Dr. John Townsend explained the path to healing and overcoming your family hurts. Each chapter of the book is written by one of the four authors. The book explored the dynamics of David, Isaac, Jesus, and their family trees. For example, David slept with Uriah’s wife, Bathsheba. She becomes pregnant with David’s child. He ordered his army to pull back in the battle lines. Uriah is killed and Bathsheba loses the baby. David’s son Amnon raped his own sister Tamar. David doesn’t comfort the issue of what happened to his daughter and it wasn’t discussed and dealt with. Absalom eventually kills Amnon. You have to handle the issues in your life or they get passed to the next generation. The authors proved that they are many things to learn about healing from our pasts. History repeats itself unless we deal with the major issues. Families pass on the concepts of “Don’t Talk”, “Don’t Feel”, and “Don’t Trust” to multiple generations if the cycle isn’t broken. The book also contains discussion questions at the end of each chapter. I have to say that with the book being written by four different authors they did a wonderful job of tying the material together in a helpful way. This book has immensely taught me the lessons that I don’t want to pass down to my kids. I see the need to heal from the past where I can move forward. I would highly recommend this helpful book to everyone. I am starting to see the traits that my family has taught me through the years. I learnt the different levels of bonding in relationships. I tend to stay in level two which is the level where people discuss events but you don’t share too much about things you’re going through. Walling yourself in and keeping a safe distance from others doesn’t help you achieve the intimacy in relationships that you need. The boundaries chapter also greatly opened my eyes. I have a difficult time saying no especially to family members! I would always feel the need to carry their problems and do things I didn’t want to do out of guilt. I also had the feelings that I was being selfish if I didn’t help them. I realize I’m not setting proper boundaries in the places they need to be placed. I found out I was codependent and not choosing how I want to live my life. The chapter about growing into adulthood was another area that I saw that I struggled with. I was feeling one down to other peers and I always thought I couldn’t ever compare to them. I thought they were so much higher up than me. I am starting to go through the process of achieving adulthood! This book really was an enormous life changing book for me. It exposed me to the truth and revealed to me the issues I haven’t seen before. If you’re struggling to heal from your past family hurts then read this book! If you don’t want to repeat something that happened in your family then pick up a copy of this book. It will help you to step forward without letting the pains from your past control your family and the next generation of your family!